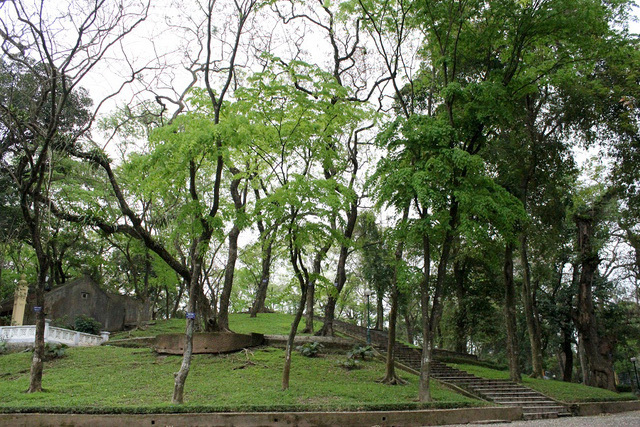 Bach Thao means “hundreds of plants” and like its name, the park is one of the few green areas in the increasingly industrialized city of Hanoi. 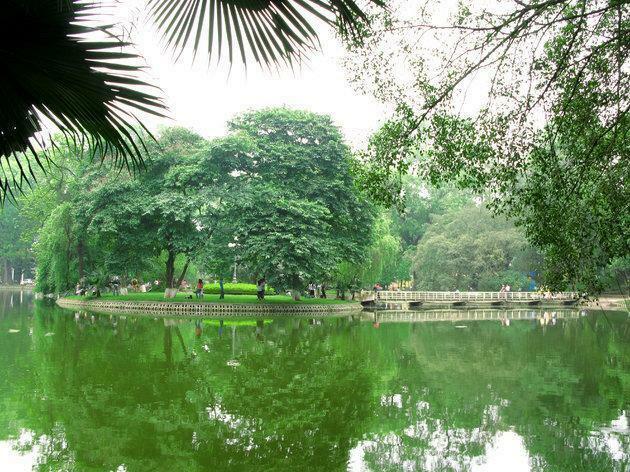 Bach Thao Park or Hanoi Botanical Garden that is located behind Ho Chi Minh Mausoleum has been known as the green lung of the capital for more than 100 years. Established by the French in 1890, the botanical garden stretched over an area of 33ha, and surrounded a number of the French’s villas at that time. Beside indigenous plants, many exotic tropical plants from all over the world were brought here and made up a rainforest right at the heart of the city. The French also grew large grass lawn, built up a hill close by a natural lake, and cages for birds, animals along wandering shady paths to make the scenery more beautiful. Many years later, Bach Thao Park was narrowed to make room for construction of historical complex of Ba Dinh. Birds and animals were taken to Thu Le Zoo (Hanoi), Sai Gon Zoo and Botanical Garden (Ho Chi Minh City). 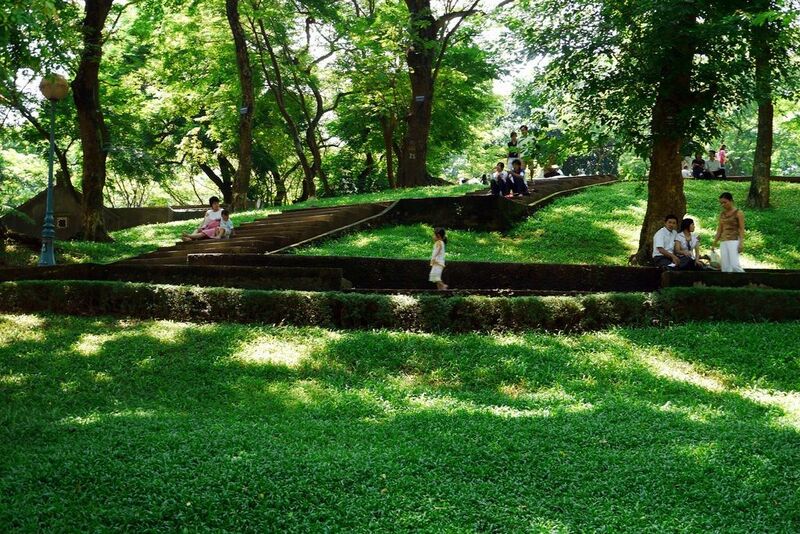 Now, the botanical garden with an area of over 10 ha is favorite place for relaxation of many Hanoians. Bach Thao is home to numerous kinds of trees that are typical for tropical rainforest like: coconut, palm, orchid, or banyan tree… Two thirds are indigenous plants, and the left are imported from other tropical regions of Africa, America and Oceania. There are old big trees that take two or three people to hug around. Here is good place for any one who is interested in botany, or looking for some nature in the city. As a complex of garden, hill and lake, the botanical garden is where people come to rest under the trees, take a walk around the lake, or watch pigeons on the islet. There is a small bridge connecting the land and the islet in the lake where pigeons are raised. The bridge and the hill are popular among the locals as nice places for taking wedding photos. Visiting Bach Thao Park in autumn, the wedding season, tourists easily catch the sight of bride and groom posing in front of camera. Sometimes, there are up to four or five couples taking photos at the same time in the park and attracting attention of many people around. In normal day, there are a lot of local people come here for morning or late afternoon exercise, playing chess in leisure time or just relaxing after a hard workday. Tourists can visit the park to know more about the locals’ lifestyle and enjoin the peace with them. 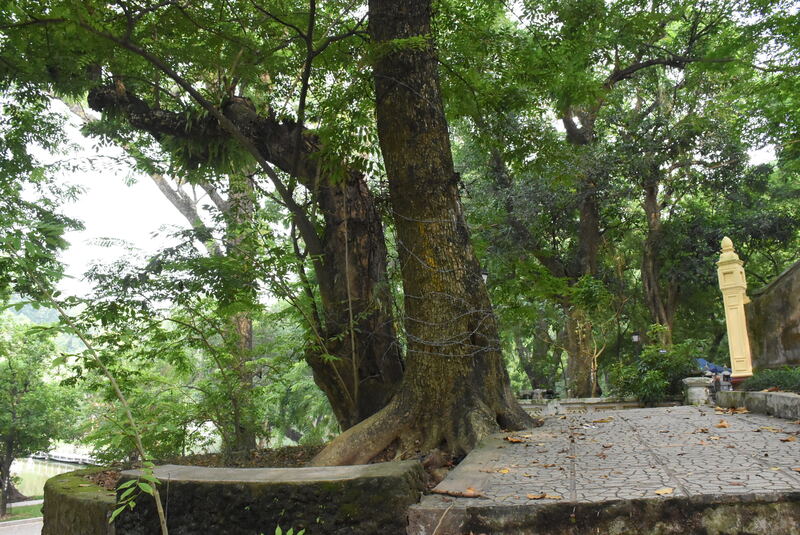 Every time is the best time to come and enjoy fresh air and tranquility in Bach Thao Park. Coming here for a picnic at the weekend or in hot summer days may be a great idea! Located behind Ho Chi Minh Mausoleum and close by West Lake, it just takes one less than 5 minutes to visit the botanical garden from Sword Lake or Hanoi Old Quarter by taxi, and very few minutes to walk from West Lake. If one wants to drive motorbike from Sword Lake to Back Thao Park, just remember to go along Hang Dao, Hang Ngang Street; then turn left at Hang Dau Street and keep straight along Quan Thanh Street; finally turn left and keep going on Hoang Hoa Tham Street till you see Bach Thao Park/ Hanoi Botanical Garden on the left hand side. Bach Thao means “hundreds of plants” and like its name, the park is one of the few green areas in the increasingly industrialized city of Hanoi. The park lies behind Ho Chi Minh Mausoleum, hidden in a quiet alley. Inside the park, one can find a large variety of trees and herbs not only from Vietnam but also Australia, Africa and Oceania. Closer to the end of the year, one can find many newlyweds taking their wedding photos at the park, at the beautiful rose garden or the little island across the bridge. Bach Thao Park can make a good picnic location for your trip to the Ho Chi Minh Complex.